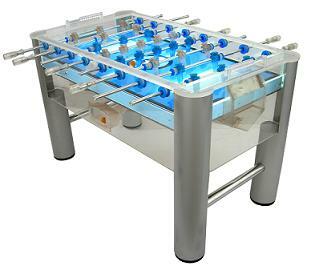 Classic Acrylic Foosball Table with Lights Game features an underlit glass playing surface with lighting system for lightning fast play. Includes 4 sanded table soccer balls for better control. The X0903-Underlit system retail price is about $999. Cabinet walls are 1.5" thick at & above the playing surface and .75" thick below the playing surface. Dimensions of the set up foosball table are: 55 1/2" x 30 1/2" x 34 1/2". Weight is 231 lbs. Classic Sport Tables are quality home use tables not designed for arcades and thus less expensive. Classic Sport tables are much better than the cheap $300 home foosball tables you find elsewhere. The main things to look for are the way the legs attach to the table (on the outside or inside of the cabinet). All of the Classic Sport tables attach on the inside which makes them stronger and more attractive when putting them into a home. Also when the table is put together it should be very stable and not wobble. Turning the table lights on at night makes the table look like an awesome fluorescent foosball table. Q: Do you have replacement parts for the SO Classic Sport X9003 table? (Actually I think I have much older version of this table) - Players- Rods- Rings (where the rods go through) Thanks! A: Unfortunately we do not sell replacement parts, Also the Manufacturer is out of business. You might be able to find a used one elsewhere. Q: Sorry, I accidentally clicked unsubscribe on the same question I posted earlier. Thus sending the same question again:Do you have replacement parts for the SO Classic Sport X9003 table (actually I think I have much older version of this table)? - Players - Rods - Rings (where the rods go through) Thanks! A: There are no parts, manuals, or anything I'm sorry to say. The manufacturer went out of business about 9 years ago. Sorry for the bad news. A: I have extra guys and some mods which make this table much faster and more fun. I don't have any extra bearings but i can show you a fix for when they loosen up.